It’s been over three years since Dream Theater’s last release: the highly divisive and sprawling The Astonishing. Fans have been desperate for some classic Dream Theater since that album came out. For this record, the band secluded themselves in a studio in New York to write and record. They said they felt as if they got back to their roots and that they had a blast making the album. And now, it’s finally coming. 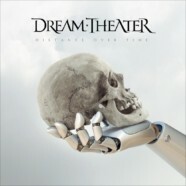 Distance Over Time is Dream Theater’s 14th studio album in their 34 years of existence. The album has elements of everything from Images & Words to Systematic Chaos to Train of Thought. It is modern and classic all at the same time and is arguably the most enjoyable Dream Theater album since 2011’s A Dramatic Turn of Events. The first half of the album is strong, kicking off with the first single “Untethered Angel”, which was the perfect lead single to this album. The track is very much what fans of the band have come to expect with shredding guitars and acrobatic keyboards, mixed with Mike Mangini’s phenomenal drumming. It is evident with this album that Mangini has come into his own much more in terms of writing his drum parts. The first half was strong, but the second half is even stronger. It is vintage Dream Theater. Songs like “S2N”, “At Wit’s End” and “Pale Blue Dot” will leave listeners’ jaws on the floor as they remember what pre-The Astonishing Dream Theater sounded like. John Myung shines in the intro of “S2N” and his bass sits further up in the mix than any recent DT album. The main riff in “At Wit’s End” is extremely fun and complex all at the same time. “Pale Blue Dot” will become of fan-favorite as it is one of the best album closers in recent memory and doesn’t even touch the 10-minute mark. It goes without saying that if you have the chance to see the band live, take it. They will be in North America until the beginning of May. Then they hit the festival circuit in Europe.